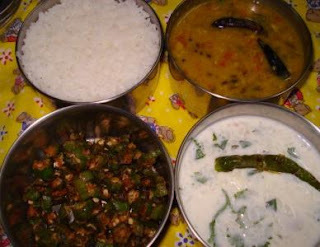 For today's lunch, we made Thotakura pappu made from our own backyard greens. We have this Spinach climber running behind in the backyard. It springs out suddenly, making on and off appearance. I have known Amma plucking these for making dal. Turns out great. Nothing like making out of fresh Vegetables, in this case, leaves. On this occasion, we ran out of all Vegetables, and didn't know what to make. Was wondering what to dish out for lunch box, when Voila, I see Green Green leaves in Athamma's hands. She said this climber has a mind of its own, it was now in full bloom. All fresh and green. So we decided to make Dal. Accompanied by okra Stir Fry. Whenever I think of Lady's Finger, I am reminded of two incidents, one, when young Amma used to say we should eat lots of Lady's Finger as we will become wiz kids...I guess every mother does it, why even I do it with my daughter. The other one was, my daughter once asked why it is called lady's finger. I said, it might be because it looks like a lady's finger, as example I showed her mine. She verified the vegetable with my fingers and said I should not cut it, as it will pain. Well I was overwhelmed with her response, I didn't know how to react. Since then every time I cut Okra, I remember that and feel good. Now coming back to the menu on hand. it was quite a simple yet satisfying one. Hubby dear even went to the extent of checking on this vein to admire its beauty. We call this Madras Palak as its the local variety. Its a well known secret at home that I dont like Green vegetable much, though I love Green colour. But after making it I know it does taste very good. Chop the onions, tomatoes. Heat the pressure cooker, add Oil, then seasoning items. Once they splutter, add Onions Curry leaves, Garlic and Red Chillies. Fry till onions are brown, then add the chopped spinach leaves. Fry till the raw smell leaves. Add tur dal and fry well. Then add chopped tomatoes, Tamarind. Add required water. Pressure cook it for 2 - 3 whistles. Bendakaya Vepudu ~ Okra Stir Fry. Amma always makes Okra Fry very crispy. Thats the way I like to eat. When we were young, not sure why but I never used to eat what my brother eats and vice versa. Of course now we can't have such fancies. Now I make and love Lady's finger. Wash and wipe dry the Lady's fingers. This makes it non - sticky and crispy when fried. Cut it into fine pieces. 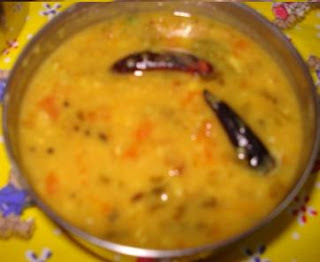 Heat oil in kadai. Add seasonings items. Once they splutter, add curry leaves, then chopped Okras. Fry well so that its well coated with oil. Simmer it without covering. If it is covered it becomes soft and sticky. 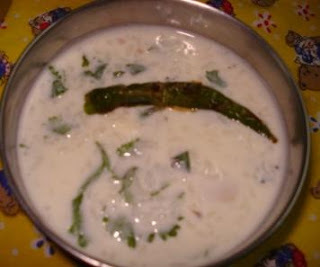 Curd Rice with Masala Mirchi. This is the same Curd rice I normally prepare. Only addition is we added Masala Mirchi. 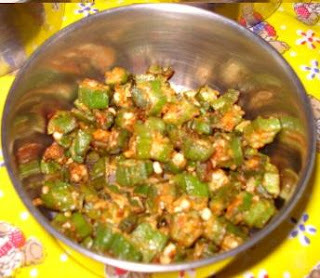 Take tender chillie which is soft and does not have lot of seeds. When you press it you will know if it has lot of seeds or not. Also its light Green in colour. Slit it in middle, dry roast on tawa.Add little salt and jeera pw. This tastes good with Dal and also Curds. Hope you enjoyed today's lunch. I have added a link to my recipe list. I got help from Sig, modified few items will be working on it more. So do check and let me know your feedback!